Jennifer Mills lives and works in Chicago after moving there from Brooklyn in 2009. She earned a Bachelor of Arts in Studio Art and French from Concordia College in Minnesota in 2007, and received a Post-Baccalaureate Certificate in Performance/Video Art from the New York Center for Art and Media Studies in 2008. She graduated in 2011 with her Master of Fine Arts from the School of the Art Institute of Chicago, where she currently teaches in the Contemporary Practices Department. As part of her artistic practice, she is involved in Chicago’s theater and comedy scene, frequently performing a fast-paced musical parody show throughout the city. She has exhibited in New York, Chicago, Los Angeles, Michigan, Minnesota, Seattle, and Berlin. Her work, which is centered on personalization and the dissemination of multiples, is in hundreds of collections worldwide. 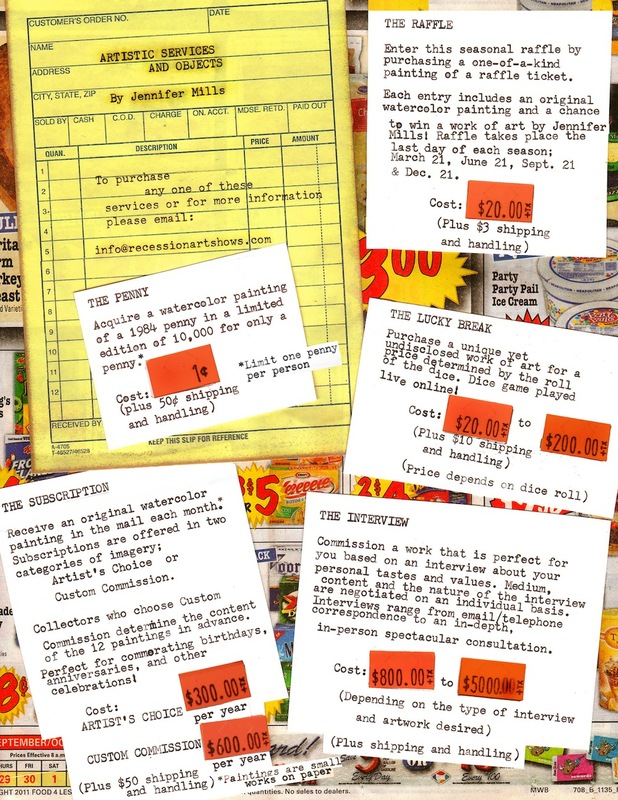 In addition to her edition of 10,000 Penny paintings (costing a penny each) and $1-5 drawings at the RAC Affordable Art Store, Mills offers a number of performance/object commissions through Recession Art. Contact Emma Katz, emma@recessionartshows.com to learn more about Mills’ menu of services, pictured below.